Since the 1960’s when long hair, bare feet and tassels ruled fashion, sundresses have been a staple in closets all across the world. These days you don’t have to be a hippie to like and wear sundresses. From the beach to a garden party, the movies to a dinner date, sundresses can be appropriate for many occasions. Usually meant for warm weather, sundresses are typically made with light and flowing fabric that drapes freely, in light folds, about the body. A more classic version, a la Lily Pulitzer, is fitted with little to no flair through the skirt. Showing a little skin is really the most defining factor of a sundress, bare shoulders are a must; necklines are left up to your discretion. Depending on the sundress pattern style you choose, along with your fabric choice will determine whether your dress is flirty or sophisticated. Here is a guide to help you choose the perfect sundress pattern. 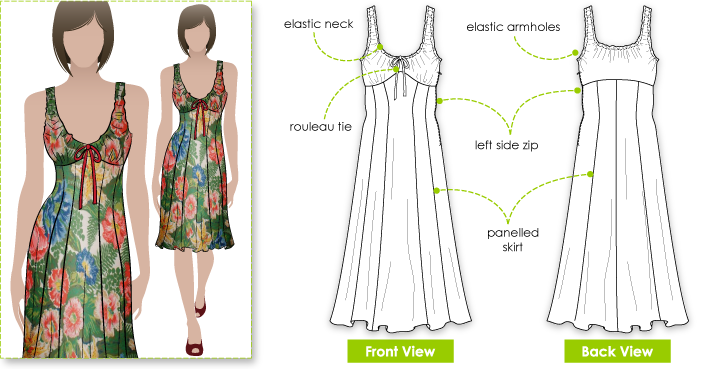 Sundress patterns come in an incredibly wide range of neckline styles. Deep, plunging V-necks are the go-to choice for lunching celebrities and breezy beach cover ups. Attending a garden party or meeting the future in-laws? Opt for a slightly higher boat neck or sweetheart neckline. Typically the lower the necklines the longer the hem while the higher necklines pair with shorter hems, but this is not a hard and fast rule. Thin spaghetti straps and thicker simple straps are most common; however since you are sewing your own you can play with many other options, lace cap sleeves perhaps? The goal is to maintain enough skin exposure to get some vitamin D in the sunshine! As previously mentioned the length of the hem usually corresponds with the type of neckline, long hems for low necklines and high hems for high necklines. This helps to keep a good balance between skin and dress. These can be mixed but be careful if you want to keep it a “sundress”, shorten the hem and lower the neckline too much and your likely to end up with a mini; lengthen the hem line to the floor and you will have a maxi-dress. While both options could be considered sundresses, they have other style components all their own. 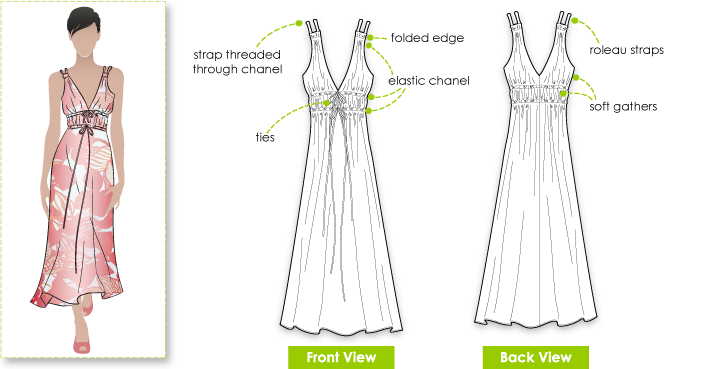 The next point to think of is what style of drape to pick for your sundress pattern. A flowing drape with gentle gathers or folds gives that breezy feel and is best for flirty, informal sundresses. For a more formal sundress, think garden party, less gathering and more structure works best. For added structure you can also use a thin interfacing or layer of tulle under the skirt. 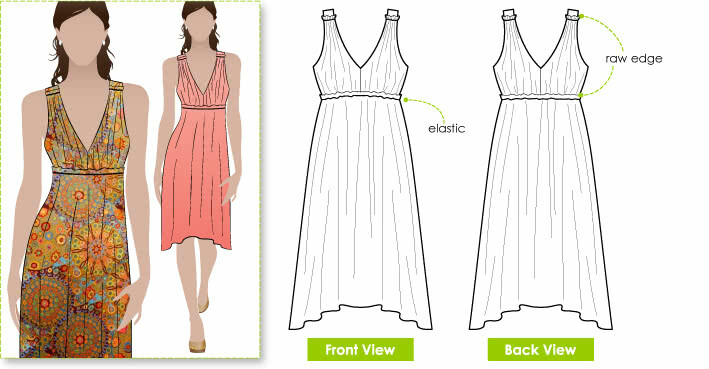 Which fabrics you choose for your sundress pattern largely depends on what drape you want to achieve. Avoid highly stiff fabrics such as brocade; if you want the final dress to be a little stiff opt for a light cotton or linen with a thin interfacing. Ideally sundresses are not stiff but rather have a little flow to them. For the quintessential breezy look choose very light fabrics: silks, charmeuse and chiffons flow beautifully. Check your fabric first, if it is see through you may want to add an interfacing in certain areas. Avoid overly stretchy fabrics and knits as they cling instead of flow. The proper details and embellishments can make a super simple, easy to sew sundress pattern into something completely amazing. There are so many options for embellishing your sundress. Try thick or thin bows at empire waist height on a flowing sundress. Shorter more structured dresses are beautiful with a belt or band which can be embellished with jewels, braided or embroidered. Piping also looks incredibly cute on this style of sundress. Shoulder straps are a fun place to add extra detail; lace, braid or coordinating colors work wonderfully to add a hint of detail and attract the eye. Ruching can be a fun way to add texture, a little at the sides of a structured dress or at the bust on a V-neck can look fabulous if it fits your style! Sundresses are fabulous, when it is warm enough to wear them! With so many style options they can be fun to mix and match, just be sure that you spread your choices over a few dresses – as Coco Chanel said, “Simplicity is the keynote of all true elegance.” The ease in which sundresses assemble makes them the perfect, versatile pick for your handmade wardrobe.